Eggs Benedict may seem like a fairly complicated dish, but even new cooks can be successful when preparing this breakfast item. In this recipe, prepared eggs are combined with other Paleo ingredients, including avocado, bacon, and a homemade hollandaise sauce that’s easy to prepare. While this recipe is simple and fulfilling, you can make adjustments to your preference (for example, if you really don’t feel up to the challenge of making the eggs as described below, preparing them over-easy or even scrambled would still work too). If you’re looking for a vegetarian option, just omit the sliced bacon in this recipe to easily transition to a meat-free meal. The key to making a successful Eggs Benedict is the careful breaking and simmering of the eggs. While it may be tempting to bring your water to a boil, your pot should remain at a light simmer to ensure the water doesn’t become so active it breaks apart your uncooked egg. Your goal is to keep your yolk intact and the white as “together” as possible, so be extra careful when breaking the eggs and place them in the water as carefully as you can (to keep from burning your fingers, try breaking them into separate bowls and using those to gently pour the eggs into the water). Eggs Benedict is a perfect stand-alone breakfast option, but since it tends to be a little fancier, let’s assume we’ll be preparing this with the need for some other options. We love the idea of serving this with some Broiled Grapefruit. If you’re a coffee drinker, check out our guide on selecting the best options for this too. Make the hollandaise sauce by whisking the egg yolks, lemon juice, cayenne, and salt in a heatproof bowl. Place the sauce on a double boiler over medium heat, constantly whisking and slowly adding the ghee until the sauce thickens. Remove the bowl, set aside, and cover to keep warm. Bring a pot of water with 1 tbsp. of apple cider vinegar to a light simmer; break the eggs carefully in the pot one at a time and cook about 3 minutes. 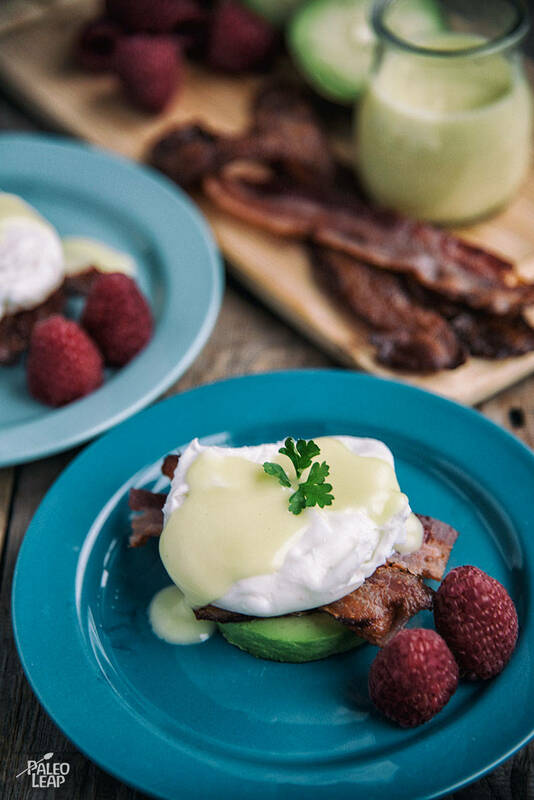 Place avocado slices on a plate; top with bacon and poached egg; drizzle eggs with hollandaise sauce. Serve the eggs sprinkled with fresh parsley.